The Thanksgiving holiday is a great time to gather with family & friends to celebrate all that we’re thankful for. Great food is always a centerpiece to the celebration, and thankfully, so is great beer. Below are some recommendations for Anchor brews to pair with the home cooking and good times this Thanksgiving. Before your friends & family show up, get the festivities started with the balanced flavor and crisp, smooth finish of Anchor California Lager. At 4.9% ABV, it’s easy to enjoy more than one, and this easy-drinking lager is a great beer for sharing once your guests arrive. The beer’s doughy malt and clean hop flavor finishes well, and since the flavors are soft and it’s a well-balanced brew, you can have one or two and easily move into food and other beverages without overloading your palate with bitterness or an enormous hop punch that can affect other flavors. When the cheese tray and Mom’s famous spinach artichoke dip make their way to the coffee table for the first football game, reach for the classic versatility of Anchor Steam Beer. One of the main principles in food and beer pairings is to match strength-with-strength, which is why Anchor Steam pairs so well with starters. Once pleasantries with the host(s) and guests have been exchanged, you’d typically do two things: 1) grab a beer to soften the edges, and 2) head for the apps. Anchor Steam’s maltiness and biscuit flavors play well with the flavors you’ll be likely to find on the apps table. It’s a versatile beer with bready flavors, high carbonation to scrub your palate after each bite, and an easy-drinking 4.9% ABV, making it a perfect pairing for smaller, bite size apps. When the turkey, stuffing, cranberry sauce, yams, mashed potatoes, and other Thanksgiving delights make their appearance, a beverage that can complement the flavor notes of this wide range of dishes can be a tough cookie to crack. Here you need something that can stand up to the roasted, caramelized, and stewed flavors while still offering enough body (but not too much), enough alcohol (bot not too much), and the right mouthfeel and carbonation to scrub your tongue so you’re ready for the next bite. That’s where Anchor Porter shines. Medium bodied, i.e. not too watery and not too thick. Lightly carbonated with a somewhat creamy mouthfeel. A good bit of dried fruit sweetness at the onset, followed immediately by a small dose of hoppy bitterness. From the middle to the finish, the roasted coffee and semi-sweet chocolate take over. The finish is somewhat dry, and when you have so many dishes to enjoy at once, Anchor Porter’s diverse flavor profile can match the roasted components, while the dry finish complements a variety of flavors – including the inevitable plate of seconds. Ah… dessert. Sometimes it’s served right away, but if your traditions are like ours, dessert seems to lack a beginning and an end. You’ll be bombarded with cookies, brownies, pumpkin & pecan pie, and a host of other delicious confections the crew has cooked up. Here you’re looking to complement, not contrast those flavors. The beer of choice should be sturdy, toasty, and chocolatey. It can include toffee notes and perhaps a hint of those traditional spices found in desserts. Our 2015 Anchor Christmas Ale hits the target on all of these interweaving elements. The beer’s 6.5% ABV is also helpful for a prolonged celebration, especially since many winter warmers can trend toward a higher ABV range of 8-10%. In other words, you’ll enjoy a complex mix of flavors without the heaviness that can often be associated with this style. Now comes the point in the evening when there’s only one item left on the agenda: a fire, a dark, a rich brew to sip on, those really comfy slippers, and evening football. Full flavor and full-bodied character make a snifter of Anchor Barrel Ale the perfect night cap. Aged in whisky barrels and in a cellar tank with charred barrel staves, you’ll get a noticeable whisky note, plus vanilla and earthy undertones. This beer certainly could pair well with a big, super sweet pecan pie, but it also drinks quite well on its own, standing in for a glass of whisky as well as any barrel-aged beer can. 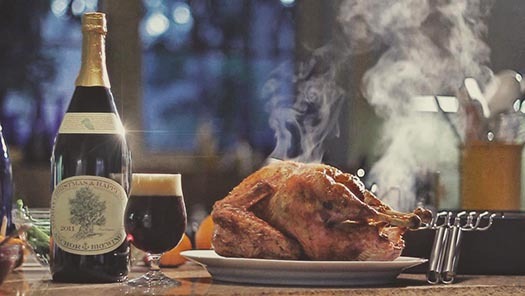 As you’re prepping your Thanksgiving shopping list, save some time and use our Beer Finder to search for these brews near you. Enjoy the holiday, and don’t forget to save enough turkey and fixin’s for a turkey sandwich (or two) the next day. Share your Thanksgiving and Anchor beer pairings with us on social media and tag @AnchorBrewing for a chance to be re-posted! Use our handy Beer Finder to locate a brew near you! Happy Thanksgiving! Always looking for beer tips for the holidays! Can’t wait to try your suggestions for Thanksgiving. Anchor Steam is one of my favorite beers, and hopefully can find the other types as well. Happy Holidays. Cheers!